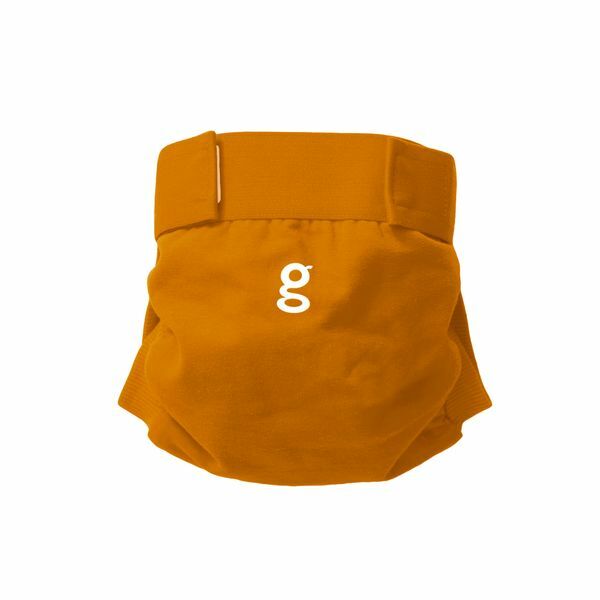 gDiapers are colourful cotton breathable nappy covers which come with a waterproof pouch that snaps in and out for added convenience and less laundry. When the nappy is soiled, simply remove the absorbent insert (disposable or reusable) and tuck in a new insert for a fresh change. Use the same gDiaper through multiple changes. Change out the snap-in pouch when dirty. More available in singles here. The waterproof pouch is made with gBreathe technology which means less rash for baby. Gentle stretch of the cover means more comfort and a flexible fit. Use with 100% biodegradable disposable inserts that you can compost or bin or with reusable washable inserts such as Bummis Prefolds. 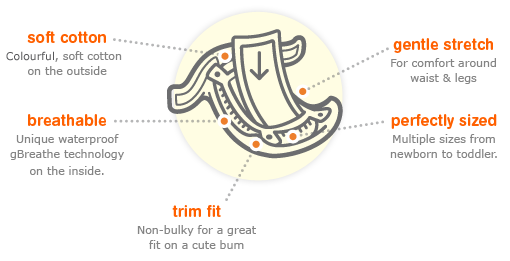 gDiapersare made of 92% cotton and 8% spandex for a gentle stretch and trim fit. gDiapers fasten around the back, away from little hands. The 'g' symbol is always at the back of the nappy. We carry medium and large sizes of the gDiapers. Medium fits babies 5-13 kg/13-28 lbs, the large size fits babies 10-16 kg/22-36 lbs. Close aplix tabs and remove snap-in pouch before washing. Machine wash at 30˚ or 40˚with like colors. Machine or line dry. Machine wash cold or warm, machine or line dry. Pouches can be machine washed at 30˚ or 40˚. Air dry. Avoid excessive handwashing. No vinegar. No bleach.